The foil is an essential structural component. It's a tech-driven product, too. 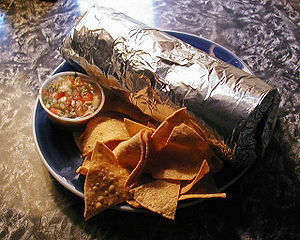 From Wikipedia: "Two key technologies that made the San Francisco burrito possible are the large flour tortilla and tortilla steamers." haha, amazing. yay sf for the foil-wrapped genius! So, when will you send some to KC???? Thanks for the post -- I grew up in San Francisco eating foil-wrapped burritos, I had no idea that it was a home town innovation! Thnx so buy viagra uk much for your posting, keep it up writing website similar subjects, I would certainly be keen to Buy generic viagra read extra stuff you.